Council utility consultants responding to questions from the City Council at a Feb. 21, 2019 meeting. Midura, Thomas and Head were at various times members of the council’s utility committee, which oversees the advisers’ contracts. And they said that historically, political connections and contributions factored in to who got hired. Clint Vince’s law firm, Dentons, also gave $25,000 to the Louisiana Democratic Party’s political action committee between 2013 and 2018, according to state campaign finance records. State Sen. Karen Carter Peterson, the chair of the Louisiana Democratic Party since 2012, was hired by Dentons in 2014. In May 2018, the City Council launched a new Smart and Sustainable Cities Committee, for which Dentons is performing billable work, according to Vince. He also sent a 31-page document enumerating the various reasons why he and the Dentons team were repeatedly selected by the council. They include the firm’s role in ending the Entergy System Agreement, absorbing Algiers into Entergy New Orleans service area and Entergy New Orleans’ partial purchase of a the Union Generating Power Station in Arkansas. While it is routine for regulators to employ consultants for their specialized expertise in areas such as litigation at the Federal Electricity Regulatory Commission or corporate mergers, critics question whether it is necessary to pay rates as high as $600 an hour for tasks that could be handled by full-time city employees. Overall, the Inspector General report found that Entergy New Orleans customers were paying roughly six times more in regulatory costs than costumers of Entergy subsidiaries regulated by the Louisiana Public Service Commission. Head, Thomas and Midura all said that the solution to the over-reliance on consultants is to build more in-house expertise. But according to Head and Thomas, the advisers actively undermined the Council’s attempts to do that. Head said she believes that the importance of political connections has waned in recent years when it comes to the consultant contracts. But she said that those past political connections helped shape the current regulatory structure. And she thinks that the lack of in-house staff has made that structure self-perpetuating and allowed the consultants to increase the size of their contracts. Harden is even more critical of the consultants than the former council members. She remains unimpressed with the work of the consultants, especially in the areas of energy efficiency and cost relief for low income customers. In 1995, New Orleans residents voted to change the city charter in an attempt to remove political patronage from who got government contracts. The amendment forced the city to employ a competitive bidding process when choosing which firms and individuals to hire. The new requirements took effect on Jan. 1, 1996. But those hoping for sweeping change were in for a disappointment. Although the charter now compelled the council to use competitive bidding, it let the council design the process. And their framework had major loopholes. “It completely eviscerated the whole purpose of competitive selection,” said Harden, who worked for The Alliance for Affordable Energy at the time. Less than a month after the city charter change, the Council announced its intention to renew the utility consultant contracts — then worth $3.8 million, according to an article in The Times-Picayune — without a competitive selection process. Then, in February, Singleton introduced a motion to specifically exempt the contracts for the utility consultants. The motion passed in March. The Alliance for Affordable Energy sued the council for violating the new charter amendment. The group argued that because utility consultant contracts comprised 90 percent of those signed by the council, the exemptions rendered the competitive selection process pointless. The Louisiana Supreme Court ultimately ruled in the Council’s favor and allowed it to hire the utility consultants without going through competitive selection. The ruling permitted the Council to extend exempted contracts without considering alternative firms. But those contracts can only be extended for a maximum of five years, at which point the council must put out a Request for Qualifications (RFQ) and sign new contracts through a selective bidding process. By 1996, the utility consultant contracts had already been the target of patronage allegations for years. In 1987, for example, the Council replaced its chief local utility lawyer with attorneys Kenneth Carter, Sidney Cates IV and Walter Wilkerson. The Times Picayune noted that “all three have political ties to Council members” as well as then-Mayor Sidney Barthelemy and former Mayor Ernest Morial. Another accusation of political favoritism came in 1992, when the Council awarded a new utility planning contract to Legend through a process that critics said was “marred by cronyism,” according to The Times-Picayune. Legend said they could fulfill the contract for $480,000. The competing firm said it could do it for only $350,000. Gary Groesch, then the director of the Alliance for Affordable Entergy, told the paper that one reason for the choice was Legend Consulting head Joseph Vumbaco’s close relationships and steady political contributions to the three members of the utility committee: Jim Singleton, Joseph Giarrusso (current District A Councilman Joseph Giarrusso’s grandfather) and Lambert Boissiere Jr. The elder Giarrusso died in 2005. Boissiere did not respond to a request for comment. The next year, the Alliance released a report claiming that those three councilmen were too cozy with Vumbaco and Vince. The report claimed that the Dentons and Legend firms, along with the councilmen, had wasted $500,000 in ratepayer money on first class air travel, limousines, expensive hotels and lavish meals in New Orleans, Washington D.C, and Denver over five years. The report also claimed that the committee and the advisers had broken Louisiana’s open meetings law on more than a dozen occasions by privately discussing government business. “If what he says is true, it’s a small price to pay for a service rendered to the ratepayers of the city,” Giarrusso told The Times-Picayune at the time. The turn of the century saw a power shift on the City Council. Singleton lost two key allies in the 2000 council elections and was booted from his long-held post as utility chair. He was replaced by Councilman Eddie Sapir and removed from the committee entirely. Two months after Singleton’s exit from the committee, Carter and Cates lost their $600,000 utility consulting contract. Karen Carter Peterson was an associate at Carter and Cates and unsuccessfully urged the committee to reconsider, according to The Times-Picayune. After Singleton lost control of the utility committee, Sapir used the position to hire one of his allies, Basile Uddo. Uddo was one of Sapir’s business partners in a real estate development firm. In 2001, he was hired for a $160,000 utility consulting contract. The contract was for telecommunications issues, but he was later hired by Dentons to work on Entergy regulation. He is still a utility consultant with Dentons today and is currently defending the council against Harden in the ongoing power plant lawsuit. During this period, there was one major change to utility regulation that occurred outside the auspices of the City Council. Until 2002, utility regulatory responsibility was split between the Council and the Mayor’s Department of Utilities. That changed under Mayor Ray Nagin. When Nagin became Mayor in 2002, an attorney named Charles Rice Jr. left his job at Entergy to become the City Attorney and later the city’s Chief Administrative Officer. Months into his term, Nagin shut down the Utilities Department as part of a broader anti-corruption campaign. The department’s director and deputy director were both arrested. The director, Lilliam Regan, was charged with seven counts of malfeasance in office for waiving $50 inspection fees and $2 a day late charges for seven cab drivers. The charges were ultimately dropped. To permanently close the department, the Nagin administration sought Council approval. Rice appeared in front of the Council to argue that Nagin’s move was legal. The council ultimately gave its blessing. Rice would go on to serve as Entergy New Orleans’ CEO from 2009 to 2018. After that episode, regulating Entergy became the sole responsibility of the Council. Utility consultants, including Uddo and Legend, contributed at least $19,000 to Nagin’s campaign funds from 2002 to 2006. Then, in 2006, the political dynamics of the council utility committee shifted again. Only months after Thomas took the reins, Peterson announced that she had forged a business relationship with Walter Wilkerson and would start advising the council on regulating Entergy. Peterson was later hired by Vince’s firm, Dentons, in 2014. Thomas’ chairmanship was short-lived. On Aug. 14, 2007, Thomas stepped down from his council seat after pleading guilty to federal bribery charges. Councilwoman Shelley Midura was thrust into the utility chair position. In her tenure, Midura aggressively sought to overturn the structure of utility regulation by trying to change the advisor RFQ, cut consultant contracts and hire outside experts to analyze the efficiency of New Orleans’ current model. But she hit some brick walls. Namely, Cynthia Willard-Lewis and Cynthia Hedge-Morrell, according to Midura and Times-Picayune coverage from those years. Willard-Lewis received at least $11,600 in contributions from the consultants while on the Council. Hedge-Morrell received at least $12,500. Neither responded to repeated requests for comment. In December 2008, Midura convinced the committee to hire a firm to do a comprehensive review of how New Orleans regulates Entergy. In May 2009, the committee interviewed the only candidate: a joint application by the Rand Corp. and the National Regulatory Research Institute. The council didn’t hire anyone to complete the review. When that faltered, Midura tried another route. In 2009, the consultant contracts reached their fifth year, forcing the council to rebid their contracts. Midura tried to amend the RFQ to make it less favorable to incumbent firms. But when she presented the new version to the rest of the utility committee, they rejected it. “Unlike some council committees, where members almost invariably take their cues from the chairman, Midura has become a minority on her own committee, frequently clashing with Hedge-Morrell and Willard-Lewis,” said a 2009 article in The Times-Picayune. The council ultimately chose the same advisers yet again. Midura, at the very least, wanted to get those contracts reduced. But she was again voted down. Midura didn’t run for reelection and in May 2010, Hedge-Morrell replaced her as chair of the utility committee. In 2011, Hedge-Morrell helped ward off a challenge to the utility consultants from Council members Stacy Head, Susan Guidry, and Kristin Palmer. The other notable challenge to the consultants in the past decade occurred during a 2016 re-bidding process. In a departure from the council’s routine, the RFQ attracted a wide field of applications and the council had legitimate alternatives to its usual set of consultants. This time, the incumbent consultants found their champion in Councilman Jason Williams, then the chair of the utility committee. 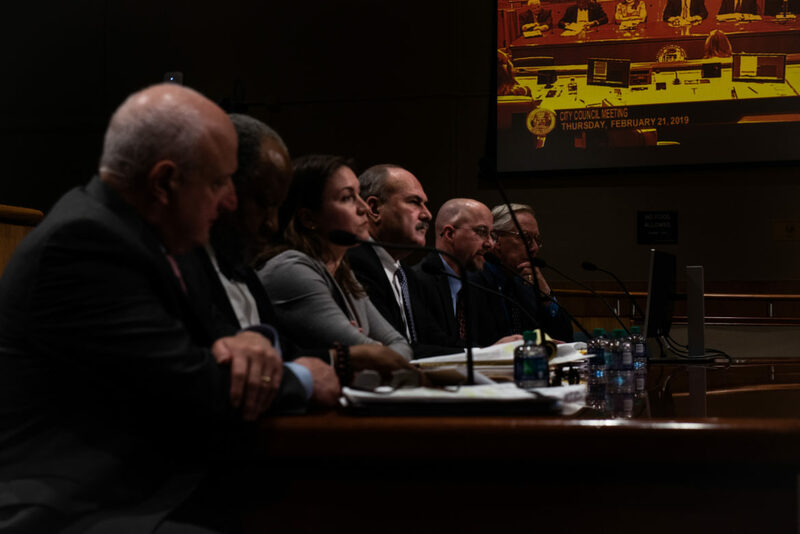 “We had learned through the grapevine — and apparently it was inaccurate — that the city was indeed serious about trying to save money,” William Demarest told NOLA.com/The Times-Picayune. Demarest applied with his Washington, D.C. law firm, Husch Blackwell LLP. But he was disappointed when the utility committee decided to hire the same group of consultants without even publicly discussing the other options. Although out of state firms had traveled to New Orleans to attend the meeting, only the current advisers were called up for questions. When Guidry and Head suggested deferring the vote so that the Council could have more time analyze the other firms, Williams shot them down. It turned into one of the most acrimonious Council meetings in recent memory. After, Demarest sent an irate email to the Council Utilities Regulatory Office. While the 2016 RFQ followed a similar pattern, it differed from the past in a key way. There didn’t appear to be a political motive behind it, Head said. Head said that New Orleans’ regulatory structure has become “preordained,” and suggested that this arrangement, given the consultants’ influence over the process, is self-reinforcing. *Correction: As originally published, this article incorrectly said that Stacy Head was not yet on the council during a discussion on rebidding consultant contracts.